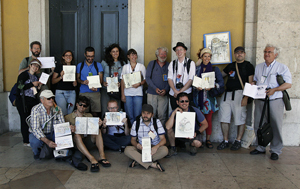 At the meeting point in the corridor of the University of fine Arts every participant of the workshop “Lisbon Perspectives” received a note consisting of ten explaining sheets about perspective drawing and a lucent grid. After the group was complete, we took our walk towards Praca do Comercio. Gérard and me, we made a little introduction there. The most important thing for us was to educate our participants in basic rules concerning perspective drawing. One important message was to explain that we all live in a sphere that surrounds as in all directions. Drawing means to represent this sphere as a whole or as a part of it. Later, we explained to different types of perspectives: a) The flat perspective places us face to face towards a window. The plain of this window projects all the elements of the space. b) The cylindric perspective places us into the axis of a cylinder and allows us to stretch our range of vision. c) The spherical perspective places us into the central point of a sphere and allows us to stretch our range of vision in all directions. We chose the spot of Praca do Comercio because it is an orthogonal place with its rectangular U-body, the central axis and the symmetrical and regular forms. 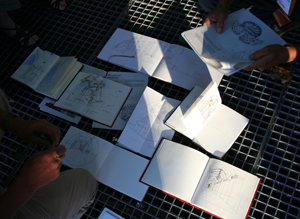 We needed on orthogonal place to let our participants try the different types of perspective drawing. For example, in an orthogonal world, there are always six vanishing points around us. There are four on the horizon (one each 90 degrees), one in the zenith and one in the nadir. The participants could use the clear grid (that they received at the beginning of the workshop) to check out the type of perspective, the horizontal line and some other hints. After this introduction, the participants of our workshop could now decide which perspective they wanted to give it a try. We didn’t tell them a time limit, neither a limit for the size of the sketch. We just wanted them to make themselves comfortable and look for a sketching spot which they like and what they wanted to attempt there. After everyone headed for a spot, we gave one-on-one consultations to each participant during the workshop that lastet at least two and a half hours after our introduction. 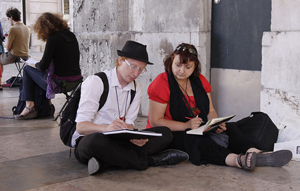 So we could check the sketching skill of each participant and give them an individual advice. To switch between sketching skills during the consultations was very exciting for us, too, because we had to rethink what we had just said to another participant just a few seconds ago. During these one-on-one consultations we gave some individual hints and tips to each drawer. As an example, you can hold a sheet or your sketchbook horizontally towards your eyes to see what is below and beneath the horizon. Or you can use your pen or pencil to set up your drawing on your sheet: find the angles of wall converging towards a vanishing point; check the proportions of a building with a simple measure using your pen; use a big sketchbook to place your two or more vanishing points onto your sheet so the construction of your perspective drawing will be easier – or explore the bottom for chewing gum spot that can work in extension as a vanishing point on your sheet. The book about the symposium is now available. 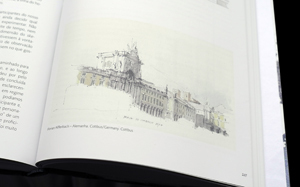 It includes some of my drawings and more than 200 full-color sketches drawn in 18 different locations in the heart of the Portuguese capital. 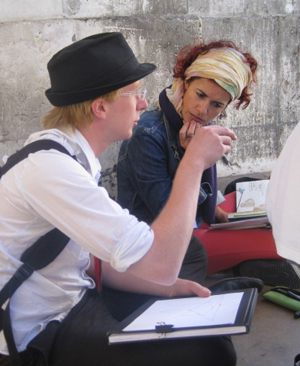 You can get it via the urban sketchers homepage.